Saruni Wild is Saruni’s private deluxe tented camp, located in a wild, scenic valley 10 km away from the main lodge in an area both rich in wildlife and privacy. Saruni Wild’s secret valley has a large resident population of elephant, giraffe, buffalo and impala. It is also a fantastic base to spot leopards and wild dogs. The tented camp is an ideal base for those interested in watching, tracking and studying elephants. An activity offered at Saruni Wild is night game drives: all the nocturnal species are abundant around the camp, from leopard to greater galago, from genet to white tailed mongoose. Set in a remote valley at the heart of the most exciting wilderness of Kenya, the camp offers a new concept of African safari: a real adventure lived in harmony with the Maasai warriors coupled with high standards of style and comfort. Saruni Wild is a design camp with oriental-styled tents with all of the comforts: flush toilets, hot and cold water, large showers, excellent Italian cuisine and open Land Rovers. Elegantly styled, Saruni Wild has two double tents, one large family tent with two en suite bedrooms and a large communal tent with a comfortable sitting and dining area. 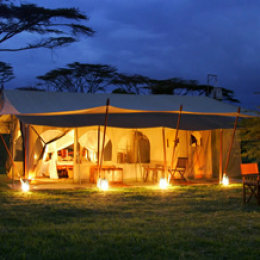 Each tent has a large verandah with uninterrupted views over the Yaile Mountains of Northern Masai Mara and a big bonfire where the Masai warriors come and dance at night. At Saruni the staff believes in the importance of good, healthy and tasty meals. The cuisine has a strong Italian flavor, but the staff loves to experiment with the great ingredients that are found in Kenya, especially fish and vegetables. Vegetarians and guests who have special requests can be easily accommodate. Saruni Wild has a common dining area designed with a mixture of old-fashioned Africa, luxury design and comfort.